What Is an English Waiver Letter? Applicants to schools or for various types of employment in English speaking countries who come from a non-English speaking country are often required to take an English competency test such as TOEFL or IELTS to demonstrate they possess a level of English proficiency that is high enough to perform will enable them to perform at an acceptable level. In some cases, ESL applicants can request that the language competency test requirement is waived. 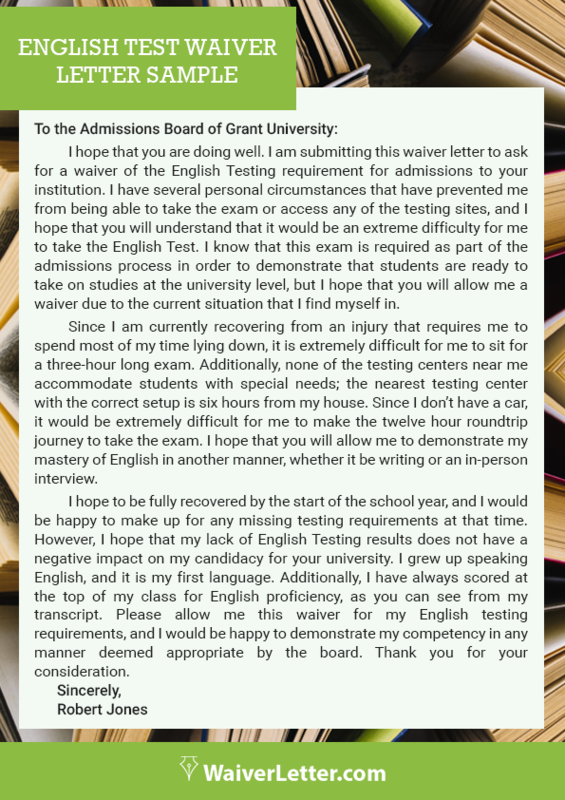 An English waiver letter is a formal written request to the organization/institution that is being applied to, that they waive the English competency test. Most organizations have basic criteria that if met, allow the exam waiver to be granted. The criteria for waiving the language exam requirement vary from, so it is recommended that you check with the specific organization/institution involved to determine whether or not you are eligible. 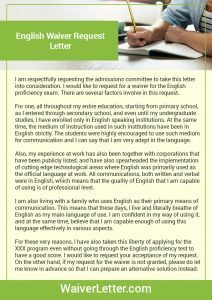 What is an English language proficiency waiver letter? 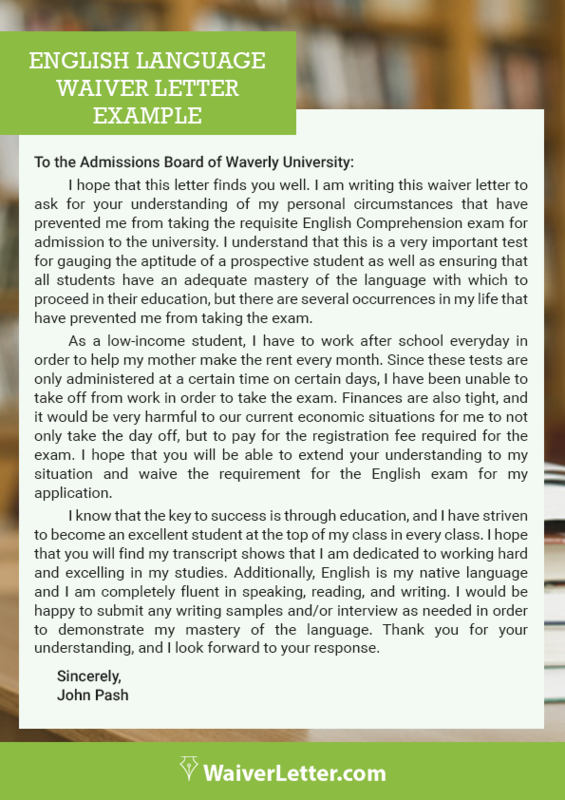 If you do not want to take an English language test, you can write a waiver letter where you will have to describe why you do not need to take it. You can read an English language test waiver request sample to see how to write one. What do I need to include on a TOEFL waiver? Read a TOEFL waiver letter example to get an idea of the things you need to include. As a general rule, you will have to attach any certificates that can work as evidence of your English level. What requirements should I meet for a TOEFL waiver? To be eligible for a TOEFL waiver, you will have to prove that you have studied in an English speaking country. You can also present another English certificate as proof of your English language proficiency. Look for a TOEFL waiver request letter sample to see how to write one. How do I write an English language test waiver? An English language test waiver sample can serve you as a guide. You will have to start by mentioning your request, followed by an explanation, and conclude your letter by thanking the reader. How do I write a waiver letter for university? Learn how to write a waiver letter for university with these simple steps. Start your letter with an introduction where you state your request. Continue your letter by writing why you are asking for that waiver and mentioning any evidence to support your argument. Finish it by thanking the reader and signing it. Salutation. First of all, it will be the date, the name and full address of the recipient, then it should be a standard greeting such as “Dear Ms. Smith” or “Admissions Committee”. First paragraph/introduction. A short paragraph stating you are requesting that the language exam requirements be waived. Body. One or two paragraphs that provide the reasons why you are requesting the English competency exam be waived. Include examples and any information that supports your reasons. Conclusion. Thank the letter recipient for their time and consideration. Your English waiver request letter should be written using a standard business letter format unless otherwise requested. Reviewing an English waiver letter format can show you how the letter should be structured, and provide some insight as to writing style and type of content that might be used. If you remain unsure about how to write your request letter, we provide a service that can help. 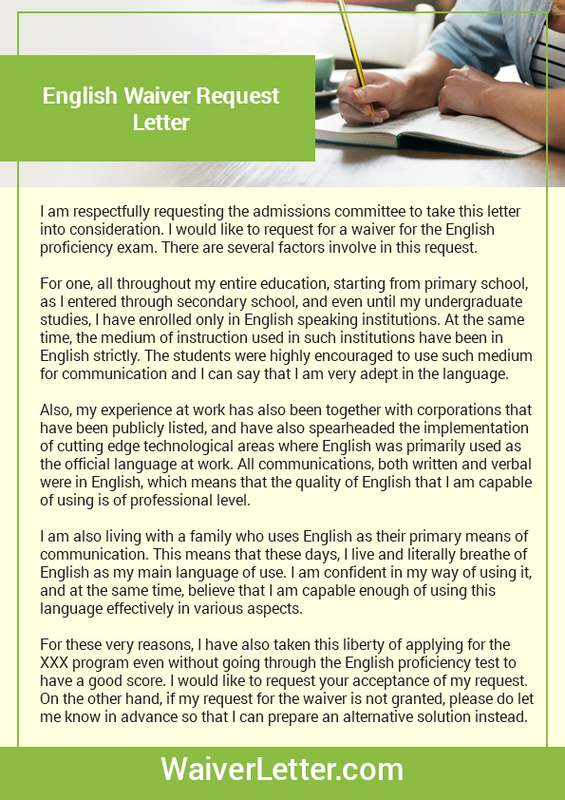 But first, you might want to take a look at our English proficiency waiver letter sample below. When applying for admissions, some students, especially international students, want to waive their English proficiency scores. Luckily, some schools grant the request but on a case-to-case basis. They may allow it under certain circumstances listed on their sites. In general, they grant the English proficiency waiver letter for students that have completed a minimum of 3.0 GPA score in a school where the primary education instructions are in English. To know more about TOEFL waiver request letter, keep reading. You’re not alone. 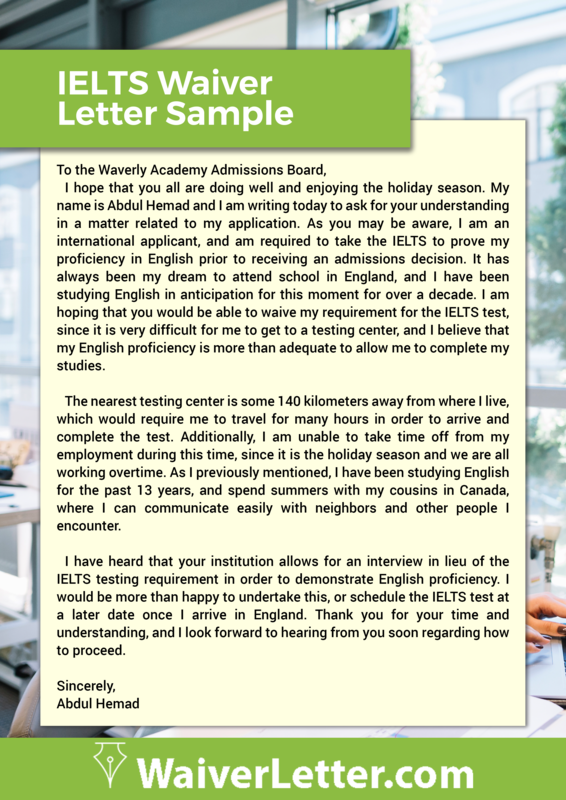 Some students looking to apply to a school requiring an IELTS, TOEFL or TOEIC score are struggling to write the waiver letter. Worry not, though. You can do something by writing a convincing waiver letter, especially if you have a working experience in a US company, organization or institution where the primary language used is English. If you’re writing the English skills waiver letter or personal statement waiver letter, you should write using a business letter format. You may also want to check for special forms, which are often published on the official website of the school. Be sure that you address the letter to the specific person, or use “Dear Sir/Madame/Admissions Committee if you are clueless on whom to address the letter. 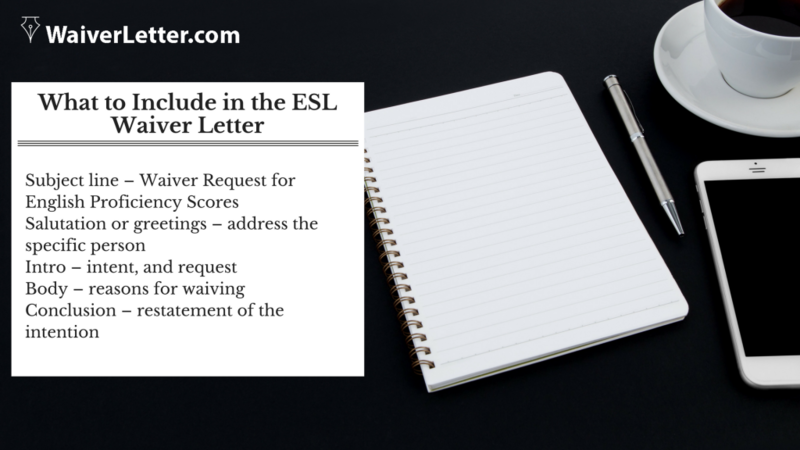 Write your intent for waiving the English proficiency score and then request for it. State the reasons you think that you can waive the requirement. Write meaty sentences, and don’t make a long waiver letter. Be sure to stick to facts. If you’re making claims, be sure to illustrate or provide samples. Finally, summarize your intent and write that you’re waiting for the reply. Don’t forget to thank the reader for the last part. SELT stands for Secure English Language Testing, which is widely spread in the United Kingdom. Our UK experts will be glad to lend you a hand with a waiver explaining why you either have not or have poorly passed your SELT. With our writers and editors, your SELT waiver will perfectly showcase your language proficiency and leave no doubt concerning your knowledge. Do you need an English test waiver letter? If you’re applying for a program requiring a high score in IELTS or any other English proficiency tests, then you may now be worried that you won’t be accepted just because you have a low score. It happens not only to you but also to other applicants, so don’t worry because you can help yourself with an essay to explain low GPA. A high English competency level is often a requirement for applicants residing outside the US. It is one of the major requirements for students whose native language is not English. However, not all students fared well in the tests, so they want to appeal that such requirement won’t count in their application, especially if it is lower than the average. So if you’re looking to prove that a low score in the English as a second language test won’t affect your performance in the course and that you deserve to complete your application without it, write a straight to the point and meaningful waiver letter. In the letter, you may address personal problems that had affected low English test scores. Without the excessive use of emotions, write in a direct manner that shows how you are well qualified for the degree even if you don’t make it to the cut of the average score requirement. If having a low score was affected by work, then you may also include it in the waiver letter. These circumstances and more can be included in the letter to prove that certain situations had hindered you from receiving high marks. However, you must also write some convincing facts, such as working in an all-English firm or company for at least a year. You may also include things like high grades in other subjects, which are pre-requisite in taking the degree. 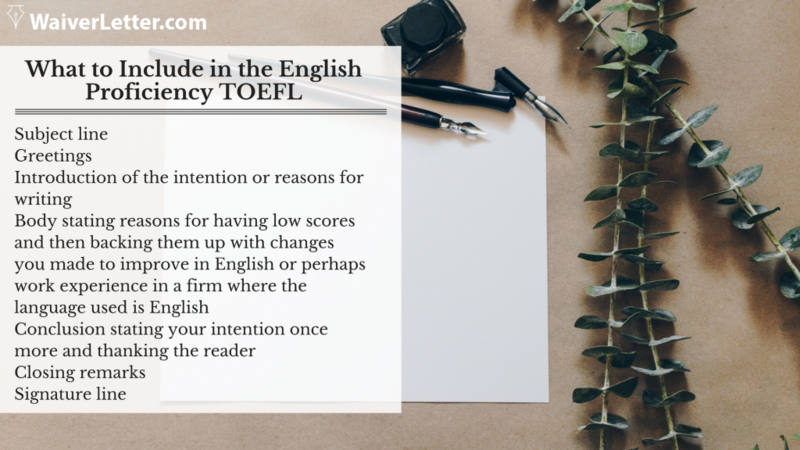 There you have what to do if you want to explain why you have not so stellar English proficiency score in your low GPA waiver letter. If you’re struggling coming up with your own, you may also get expert help. Contact us for a well-written and effective English waiver letter from one of our waiver letter experts! Get help from the pros for topnotch English proficiency waiver letter today! Write a cogent English waiver letter with our pros! Thanks for everything, please close the case. I will be sending two more memos later and this time there will be more time. Once again, thanks.